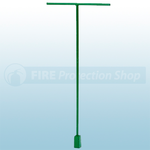 Available from the Fire Protection Shop is the Green Steel Hydrant Key and Bar which is ideal for turning the water supply on and off via the hydrant. The hydrant is strong and made from robust steel consutrction. Also available is the Steel Hydrant Key And Bar and Aluminium Hydrant Key And Bar. Both bars are used to turn on and off the water supply on underground hydrants. 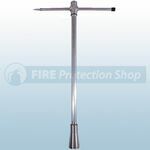 Can also be used for lifting the hydrant cover as the bar is slotted at one end.